Elwin L. Schott was born on 2 June 1918 at Marquette, Iowa. He was the son of Lloyd E. Schott and Rose E. (?). Elwin L. Schott married Catherine T. Johnson, daughter of Joseph Johnson and Margaret Friel, after 1940. Elwin L. Schott died on 19 October 2015 at age 97 Elwin Schott, 97, passed peacefully to his eternal life on October 19, 2015. Surrounded by love. Elwin was treasured by many and will be missed by his 5 children, 3 grandsons and 3 son-in-law's. A Celebration of Life Service will be held Fri. November 13, 2015, @2PM in the Village Center at Covenant Village 9215 W Broward Blvd Plantation, FL 33324. As a WWII Veteran and POW interment will be at a later date at South Florida National Cemetery. Memorial contributions may be made to the Covenant Village Benevolent Fund or First Baptist Church Ft Lauderdale. He was buried in 2016 at South Florida National Cemetery, Lake Worth, Palm Beach, Florida. Elwin L. Schott and Catherine T. Johnson lived in 2006 at 7254 East Tropical Way, Fort Lauderdale, Broward, Florida. [S243] U.S. Federal Census 1920 U.S. Federal Census, by Ancestry.com, ED76. Dwelling 104. Name Variation Ovid Ruben Mann was also known as Ovil R.
Name Variation Ovid Ruben Mann was also known as Reuben O. Name Variation Ovid Ruben Mann was also known as Ovid E.
Name Variation Ovid Ruben Mann was also known as Ruben. Name Variation Ovid Ruben Mann was also known as O. R.
Ovid Ruben Mann was born in April 1855 at Indiana. He was the son of Oliver Mann and Rebecca Jane Herring. Ovid Ruben Mann died on 28 April 1916. He was buried after 28 April 1916 at Glendale Cemetery, Polk, Iowa. 1915 Des Moines, Polk, Iowa He appeared on the census of 1915 at Des Moines, Polk, Iowa. [S248] U.S. Federal Census 1860 U.S. Federal Census, by Ancestry.com, Year: 1860; Census Place: Adams, Hamilton, Indiana; Roll: M653_263; Page: 187; Family History Library Film: 803263. [S247] U.S. Federal Census 1870 U.S. Federal Census, by Ancestry.com, Year: 1870; Census Place: Black Hawk, Jefferson, Iowa; Roll: M593_399; Page: 14A; Family History Library Film: 545898. [S246] U.S. Federal Census 1880 U.S. Federal Census, by Ancestry.com, ED166. Dwelling 393. [S245] U.S. Federal Census 1900 U.S. Federal Census, by Ancestry.com, ED83. Dwelling 226. [S244] U.S. Federal Census 1910 U.S. Federal Census, by Ancestry.com, ED131. Dwelling 61. Name Variation Jack Mann was also known as Fergus. Name Variation Jack Mann was also known as John F.
Jack Mann was born on 3 December 1894 at Des Moines, Polk, Iowa, also reported as 05 Dec 1891. He was the son of Ovid Ruben Mann and Mary Agnes Friel. Jack Mann married Mallie Van Skike, daughter of Albert B. Van Skike and Sarah T. Beerbower, on 24 January 1925 at Polk, Iowa. Jack Mann died on 1 December 1947 at age 52 Obituary including picture published in The Des Moines Register 3 Dec 1947. He was buried after 1 December 1947 at Glendale Cemetery, Des Moines, Polk, Iowa, military tombstone; Navy veteran. 1 January 1925 Des Moines Ward 7, Polk, Iowa Jack Mann appeared on the census of 1 January 1925 in the household of Albert B. Van Skike at Des Moines Ward 7, Polk, Iowa. [S243] U.S. Federal Census 1920 U.S. Federal Census, by Ancestry.com, ED131. Dwelling 174. Name Variation Mayme Mann was also known as Mary A. Married Name before 1903 As of before 1903,her married name was Debolt. Mayme Mann was born in December 1880 at Iowa. She was the daughter of Ovid Ruben Mann and Mary Agnes Friel. Mayme Mann married David Debolt before 1903. Mayme Mann was buried in 1968 at Jordan Cemetery, West Des Moines, Polk, Iowa. Name Variation Catherine Mann was also known as Katherine. Name Variation Catherine Mann was also known as Kathryn. Name Variation Catherine Mann was also known as Katie. Catherine Mann was born in April 1891 at Missouri also reported as Wisconsin. As of 1 January 1925, Catherine Mann was never married. 1 January 1925 Des Moines Ward 7, Polk, Iowa Catherine Mann is listed as lodger (actually niece of wife) on the census of 1 January 1925 in the household of Joseph Johnson at Des Moines Ward 7, Polk, Iowa. [S250] U.S. Federal Census 1930 U.S. Federal Census, by Ancestry.com, ED77-75. Dwelling 195. Name Variation Reuben O. Mann Jr. was also known as Rube. Name Variation Reuben O. Mann Jr. was also known as Ruben. Reuben O. Mann Jr. was born on 3 October 1887 at Iowa also reported as Oct 1884. As of 1930, Reuben O. Mann Jr. was never married. He died on 21 February 1935 at Des Moines, Polk, Iowa, at age 47 brief obituary published in The Des Moines Register 22 Feb 1935. 1905 Polk, Iowa Reuben O. Mann Jr. appeared on the census of 1905 at Polk, Iowa. On 5 June 1917 at World War I Draft Registration, Des Moines City, Polk, Iowa, He served as a Private in the 164th Infantry, 41st Division from Iowa during World War I. [S250] U.S. Federal Census 1930 U.S. Federal Census, by Ancestry.com, Year: 1930; Census Place: Des Moines, Polk, Iowa; Roll: 675; Page: 24B; Enumeration District: 0048; Image: 783.0; FHL microfilm: 2340410. Name Variation Bridget Florine Mann was also known as Brid. Name Variation Bridget Florine Mann was also known as Bid. Name Variation Bridget Florine Mann was also known as Betty. Married Name 14 November 1910 As of 14 November 1910,her married name was Jones. Married Name circa 1924 As of circa 1924,her married name was Melvin. Bridget Florine Mann was born in February 1893 at Des Moines, Polk, Iowa. 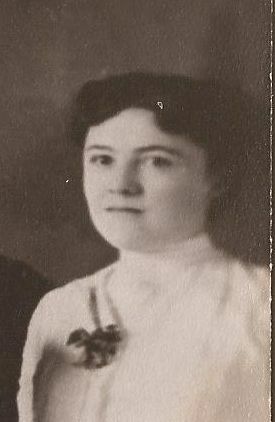 Bridget Florine Mann married George Benjamin Jones, son of George Jones and Mary Rees, on 14 November 1910 at Indianola, Warren, Iowa. Bridget Florine Mann married Henry Melvin circa 1924. Bridget Florine Mann died on 5 September 1966 at age 73. [S250] U.S. Federal Census 1930 U.S. Federal Census, by Ancestry.com, Year: 1930; Census Place: Hartley, O´Brien, Iowa; Roll: 671; Page: 5B; Enumeration District: 0017; Image: 1576.0; FHL microfilm: 2340406. [S373] U.S. Federal Census 1940 U.S. Federal Census, by Ancestry.com, Year: 1940; Census Place: Hartley, O'Brien, Iowa; Roll: T627_1187; Page: 16A; Enumeration District: 71-17. Name Variation Grace Coyle was also known as Gracie. Married Name 13 May 1880 As of 13 May 1880,her married name was Friel. Grace Coyle was born in 1861 at Ireland also reported as August 1862 in Ohio. She was the daughter of John Coyle and Ann Call. Grace Coyle died on 10 May 1947 at at home, Iowa, obituary published in The Des Moines Register 11 May 1947. Grace Coyle immigrated circa 1867. In 1905 Friel family photo. [S247] U.S. Federal Census 1870 U.S. Federal Census, by Ancestry.com, Stamp 287. Dwelling 145. [S246] U.S. Federal Census 1880 U.S. Federal Census, by Ancestry.com, ED166. Dwelling 404. [S245] U.S. Federal Census 1900 U.S. Federal Census, by Ancestry.com, ED95. Dwelling 395. Name Variation Mary Anne Friel was also known as Mayme. Married Name 18 June 1902 As of 18 June 1902,her married name was Welsh. Mary Anne Friel was born on 13 June 1883 at Iowa. She was the daughter of Fergus Friel and Grace Coyle. Mary Anne Friel married George W. Welsh, son of William Welsh and Sarah Boomer, on 18 June 1902 at Polk, Iowa. Mary Anne Friel died on 21 July 1949 at age 66. 1 January 1925 Des Moines Ward 8, Polk, Iowa Mary Anne Friel appeared on the census of 1 January 1925 in the household of George W. Welsh at Des Moines Ward 8, Polk, Iowa. Mary Anne Friel had 3 with 3 living in 1910 children. Catherine Emma Friel died on 13 June 1883. She was born on 13 June 1883. Name Variation Catherine Agnes Friel was also known as Katherine. Name Variation Catherine Agnes Friel was also known as Kate. Married Name 28 November 1911 As of 28 November 1911,her married name was O'Hara. Catherine Agnes Friel was born on 18 December 1884 at Iowa. Catherine Agnes Friel married Leonard Francis O'Hara, son of Edward B. O'Hara and Harriett Mary Denson, on 28 November 1911 at Polk, Iowa. Catherine Agnes Friel died in 1968. 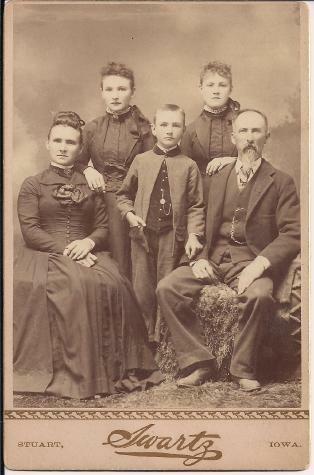 In 1905 Friel family photo. Name Variation Peter Marion Miller was also known as P. M.
Name Variation Peter Marion Miller was also known as John. 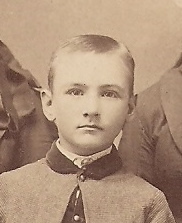 Peter Marion Miller was born in July 1854 at Iowa also reported as 1856. Peter Marion Miller died before 1910. [S245] U.S. Federal Census 1900 U.S. Federal Census, by Ancestry.com, Year: 1900; Census Place: Des Moines, Polk, Iowa; Roll: 453; Page: 6A; Enumeration District: 0074; FHL microfilm: 1240453. Name Variation Patrick William Miller was also known as William Patrick. Patrick William Miller was born in August 1882 at Des Moines, Polk, Iowa, also reported as Aug 1881. He was the son of Peter Marion Miller and Ellen Alice Friel. Patrick William Miller married Iva Richards on 17 June 1903 at Polk, Iowa. Patrick William Miller married Bertha M. Beckmon, daughter of William Beckmon and Etta Krause, on 28 January 1907 at 2nd marriage for him; 1st for her, Polk, Iowa. Name Variation Agnes Miller was also known as Bridget Agnes. Married Name circa 1921 As of circa 1921,her married name was Friedel. Agnes Miller was born on 15 January 1903 at Iowa. She was the daughter of Peter Marion Miller and Ellen Alice Friel. Agnes Miller married Edwin A. Friedel, son of August M. Friedel and K. Minnie Weis, circa 1921. Agnes Miller died on 29 October 1993 at age 90. Agnes Miller obtained US Social Security Card at Iowa; last residence Sioux Falls, Minnehaha, South Dakota. [S244] U.S. Federal Census 1910 U.S. Federal Census, by Ancestry.com, Year: 1910; Census Place: Des Moines Ward 4, Polk, Iowa; Roll: T624_420; Page: 9A; Enumeration District: 0132; Image: ; FHL microfilm: 1374433. [S243] U.S. Federal Census 1920 U.S. Federal Census, by Ancestry.com, Year: 1920; Census Place: Des Moines Ward 4, Polk, Iowa; Roll: T625_509; Page: 6A; Enumeration District: 131; Image: 114. [S250] U.S. Federal Census 1930 U.S. Federal Census, by Ancestry.com, ED77-60. Dwelling 506. John Paul Miller was born on 25 December 1884 at Des Moines, Polk, Iowa, also reported as Jan 1885. 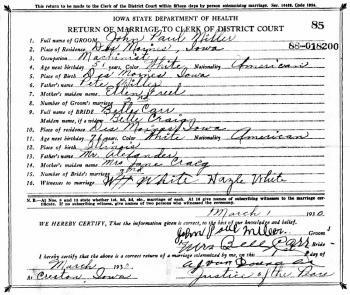 John Paul Miller married Ethel S. Chandler on 18 November 1916 at first marriage for both, Des Moines, Polk, Iowa. John Paul Miller and Ethel S. Chandler were divorced before 1918 or possibly annulment; John is listed as "first marriage" for his 1919 marriage to Abbie Hyde. John Paul Miller married Abbie Hyde on 6 June 1919 at listed as 1st marriage for both, Des Moines, Polk, Iowa. 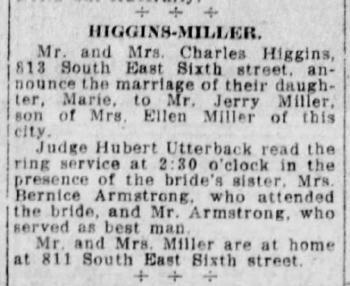 John Paul Miller married Belle Craig on 1 March 1930 at listed as 2nd marriage for both, Creston, Polk, Iowa, marriage announcement published in The Des Moines Register 04 Mar 1930. John Paul Miller obtained US Social Security Card at Iowa; original SSN. 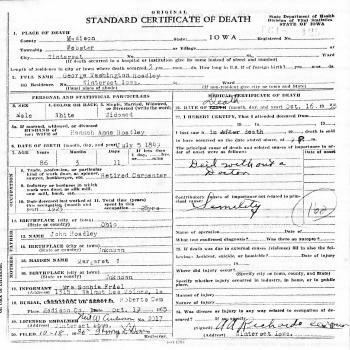 Jerry C. Miller was born in January 1891 at Iowa also reported as 1892. 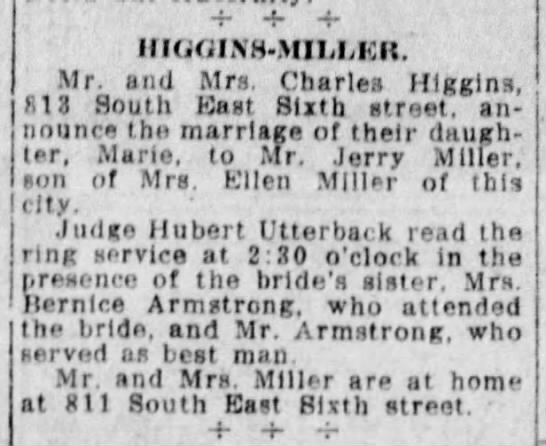 Jerry C. Miller married Marie Higgins, daughter of Charles Higgins and Belva Evans, on 13 August 1922 at Des Moines, Polk, Iowa, Jerry Miller - Marie Higgins marriage announcement. Jerry C. Miller died in 1967. He was buried in 1967 at Glendale Cemetery, Des Moines, Polk, Iowa. 1 January 1925 Des Moines Ward 6, Polk, Iowa Jerry C. Miller appeared on the census of 1 January 1925 at Des Moines Ward 6, Polk, Iowa. [S250] U.S. Federal Census 1930 U.S. Federal Census, by Ancestry.com, Year: 1930; Census Place: Des Moines, Polk, Iowa; Roll: 676; Page: 21A; Enumeration District: 0061; Image: 526.0; FHL microfilm: 2340411. [S373] U.S. Federal Census 1940 U.S. Federal Census, by Ancestry.com, Year: 1940; Census Place: Des Moines, Polk, Iowa; Roll: T627_1193; Page: 8B; Enumeration District: 100-28. Married Name Her married name was Mace. Mary Miller married John Mace. Mary Miller was born in July 1887 at Iowa. Name Variation Kathryn Miller was also known as Kate. Kathryn Miller was born in September 1889 at Iowa. Married Name 9 May 1915 As of 9 May 1915,her married name was Beener. Elizabeth Miller was born on 15 January 1896 at Iowa also reported as Jan 1895. 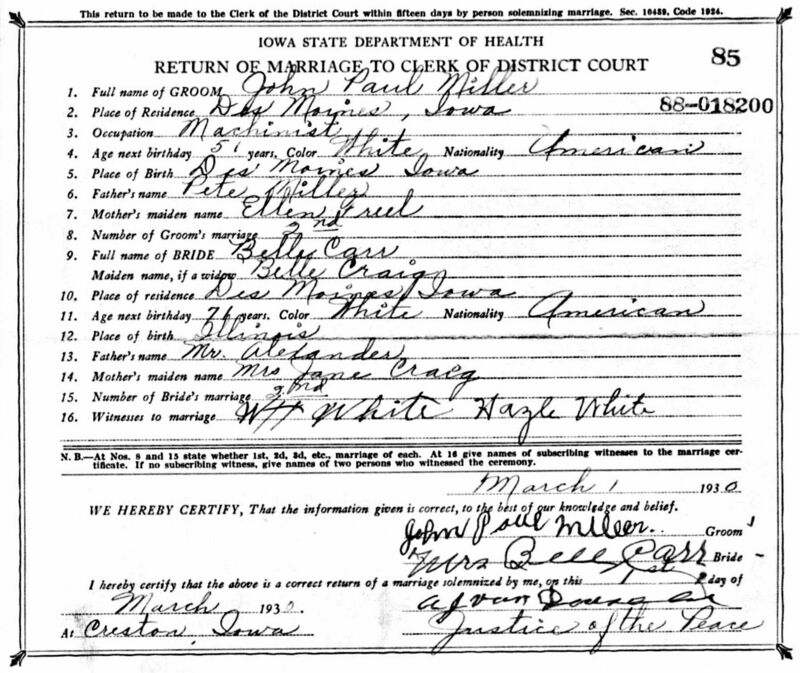 Elizabeth Miller married Philip J. Beener, son of Philip J. Beener and Annie Hultzhouser, on 9 May 1915 at Polk, Iowa. Elizabeth Miller died in July 1983 at age 87. Elizabeth Miller obtained US Social Security Card at Iowa; last residence West Des Moines, Polk, Iowa. Married Name 6 October 1920 As of 6 October 1920,her married name was Anderson. Sarah B. Miller was born in May 1897 at Iowa. Sarah B. Miller married Mounty David Anderson, son of Bradley Anderson and Martha J. Bloodworth, on 6 October 1920 at 2nd marriage for her; 1st for him, Boone, Iowa. [S250] U.S. Federal Census 1930 U.S. Federal Census, by Ancestry.com, Year: 1930; Census Place: Polk, Marion, Iowa; Roll: 668; Page: 3B; Enumeration District: 0026; Image: 498.0; FHL microfilm: 2340403. [S373] U.S. Federal Census 1940 U.S. Federal Census, by Ancestry.com, Year: 1940; Census Place: Polk, Marion, Iowa; Roll: T627_1181; Page: 5A; Enumeration District: 63-27. Name Variation Josephine Loretta Miller was also known as Loretta. Name Variation Josephine Loretta Miller was also known as Josie. Married Name before 1917 As of before 1917,her married name was Volcano. Married Name before 1917 As of before 1917,her married name was Vulcano. Married Name 10 December 1921 As of 10 December 1921,her married name was Finaro. Married Name 10 December 1921 As of 10 December 1921,her married name was Funaro. Josephine Loretta Miller was born in April 1900 at Iowa. Josephine Loretta Miller married James S. Vulcano before 1917 at first husband. Josephine Loretta Miller married Charles Finaro, son of Bernard Finaro and Philamine (? ), on 10 December 1921 at second marriage for both, Polk, Iowa. Josephine Loretta Miller was buried in 1932 at Glendale Cemetery, Des Moines, Polk, Iowa. Name Variation Anna C. Miller was also known as Annie. Married Name 7 June 1922 As of 7 June 1922,her married name was Attice. Married Name 7 June 1922 As of 7 June 1922,her married name was Athas. Married Name 12 April 1941 As of 12 April 1941,her married name was Denhart. Anna C. Miller was born in 1906 at Iowa. Anna C. Miller married John Alexander Athas, son of John Athas and Stamata (? ), on 7 June 1922 at Polk, Iowa. Anna C. Miller and John Alexander Athas were divorced before 1940. Anna C. Miller married Joseph Roy Denhart on 12 April 1941 at Worth, Missouri. Anna C. Miller died in 1958. She was buried in 1958 at Glendale Cemetery, Des Moines, Polk, Iowa. [S250] U.S. Federal Census 1930 U.S. Federal Census, by Ancestry.com, Year: 1930; Census Place: Bloomfield, Polk, Iowa; Roll: 673; Page: 13B; Enumeration District: 93; Image: 422.0; FHL microfilm: 2340408. [S373] U.S. Federal Census 1940 U.S. Federal Census, by Ancestry.com, Year: 1940; Census Place: Des Moines, Polk, Iowa; Roll: T627_1195; Page: 13B; Enumeration District: 100-69. 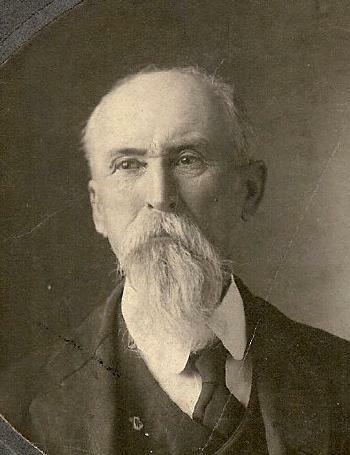 George Washington Hoadley was born on 5 July 1849 at Western Ohio also reported as July 1847; also reported as Michigan. He was the son of John Hoadley and Margaret E. Lewis. George Washington Hoadley married Hannah Ann Fox, daughter of Dixon Fox and Sarah Ann Everett, on 2 June 1873 at Iowa. George Washington Hoadley died on 16 October 1935 at Boone, Boone, Iowa, at age 86 George W. Hoadley, aged Madison county resident, died at the home of his niece, Della Tracey, Wednesday, October 16th, at the age of 86 years. Mr. Hoadley had been ill for several months. The deceased was born in Western Ohio, July 5, 1849, and was married to Hannah Fox, June 2, 1873. His wife died in 1919, and one daughter, Mrs. Cora Hills has preceeded him in death. A daughter, Sophia Friel of Des Moines, and a son John Hoadley of Reading, Pennsylvania survive him. He also leaves ten grandchildren and four great grandchildren. The Rev. H. L. Olmstead, pastor of the Church of Christ conducted his funeral services at Tidrick's funeral home, Saturday morning, at 10:30 o'clock, and burial was in Webster cemetery west of Winterset. Winterset Madisonian, Winterset, Iowa October 24, 1935. He was buried after 16 October 1935 at Roberts Cemetery, Harrison, Adair, Iowa. 1856 Mantua, Monroe, Iowa George Washington Hoadley appeared on the census of 1856 in the household of John Hoadley at Mantua, Monroe, Iowa. 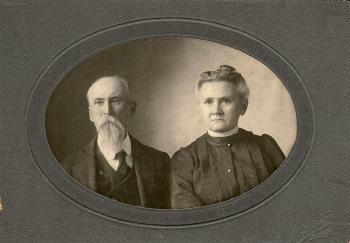 George and Hannah Fox Hoadley portrait. [S249] U.S. Federal Census 1850 U.S. Federal Census, by Ancestry.com, Year: 1850; Census Place: Ogden, Lenawee, Michigan; Roll: M432_355; Page: 171A; Image: 346. [S248] U.S. Federal Census 1860 U.S. Federal Census, by Ancestry.com, Dwelling 326. [S246] U.S. Federal Census 1880 U.S. Federal Census, by Ancestry.com, ED7. NA Film Number T9-0325 Page Number 109B. [S245] U.S. Federal Census 1900 U.S. Federal Census, by Ancestry.com, ED95. Dwelling 159. Listed as Hoabley. [S244] U.S. Federal Census 1910 U.S. Federal Census, by Ancestry.com, ED23. Dwelling 265. [S243] U.S. Federal Census 1920 U.S. Federal Census, by Ancestry.com, ED24. Dwelling 390. [S250] U.S. Federal Census 1930 U.S. Federal Census, by Ancestry.com, ED61-2. Dwelling 340. Married Name 2 June 1873 As of 2 June 1873,her married name was Hoadley. 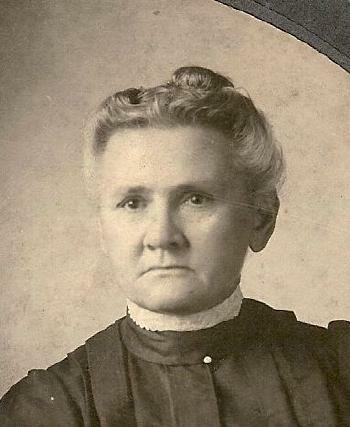 Hannah Ann Fox was born on 17 July 1851 at Albia, Indiana, also reported as 17 July 1852; also listed as July 1850. She was the daughter of Dixon Fox and Sarah Ann Everett. Hannah Ann Fox married George Washington Hoadley, son of John Hoadley and Margaret E. Lewis, on 2 June 1873 at Iowa. Hannah Ann Fox died on 7 January 1919 at from an applectic stroke, Winterset, Madison, Iowa, at age 67 Hannah A. Fox, daughter of Dixon and Sarah A. Fox, was born on 17 July 1851, and died at her home in Winterset, Iowa on January 7, 1919 aged 67 years, 5 months and 21 days. She was married to George W. Hoadley on June 26, 1873. To this union was born three children: Mrs. L. H. Hills, of Winterset; Mrs. H. F. Friel, of Boone and John Hoadley, of Des Moines, all of whom are living and were present and together with their aged father mourn the loss of a devoted wife and mother. She also leaves two brothers, E. E. Fox, of Adair county, H. F. Fox, of Des Moines and one sister, Mrs. John Lee of Carrute, Oklahoma, one half sister, Mrs. George Darnall, of this county, and one half brother, Willis Chambers of Brookings, South Dakota and eleven grand children and other relatives and many friends. She was converted in early girlhood and united with the M. E. church to which faith she adhered until death. She was a kind, self-sacrificing wife and mother, an obliging, generous neighbor and a faithful friend. We shall miss her but our loss is her eternal gain. The funeral services were held in the home on Thursday morning, conducted by Rev. Hozier, and the body was laid to rest in the Roberts cemetery in the neighborhood of her old home. note: Roberts Cemetery is in Harrison Township, Adair County. She was buried after 7 January 1919 at Roberts Cemetery, Harrison, Adair, Iowa. 1856 Pleasant, Monroe, Iowa Hannah Ann Fox appeared on the census of 1856 in the household of Dixon Fox at Pleasant, Monroe, Iowa; name listed as Dickson. Hannah Ann Fox had 3 with 3 living in 1900 children. [S248] U.S. Federal Census 1860 U.S. Federal Census, by Ancestry.com, Year: 1860; Census Place: Pleasant, Monroe, Iowa; Roll: M653_336; Page: 320; Image: 323; Family History Library Film: 803336. [S247] U.S. Federal Census 1870 U.S. Federal Census, by Ancestry.com, Year: 1870; Census Place: Pleasant, Monroe, Iowa; Roll: M593_412; Page: 400A; Image: 312; Family History Library Film: 545911. Married Name circa 1896 As of circa 1896,her married name was Hills. Cora Elizabeth Hoadley was born on 8 March 1874 at Iowa also reported as April 1876. She was the daughter of George Washington Hoadley and Hannah Ann Fox. Cora Elizabeth Hoadley married Leonard Henry Hills, son of Abel B. Hills and Susan Bell, circa 1896. Cora Elizabeth Hoadley died on 1 June 1935 at age 61. She was buried after 1 June 1935 at Winterset Cemetery, Madison, Iowa. 1 January 1925 Des Moines Ward 3, Polk, Iowa Cora Elizabeth Hoadley appeared on the census of 1 January 1925 in the household of Leonard Henry Hills at Des Moines Ward 3, Polk, Iowa. [S245] U.S. Federal Census 1900 U.S. Federal Census, by Ancestry.com, ED21. Dwelling 648. [S244] U.S. Federal Census 1910 U.S. Federal Census, by Ancestry.com, ED23. Dwelling 264. [S243] U.S. Federal Census 1920 U.S. Federal Census, by Ancestry.com, Year: 1920; Census Place: Winterset Ward 2, Madison, Iowa; Roll: T625_499; Page: 14B; Enumeration District: 24; Image: 341. Name Variation John Samuel Hoadley was also known as J. S.
John Samuel Hoadley was born on 18 December 1878 at Eddyville, Iowa, also reported as 18 Dec 1879. He was the son of George Washington Hoadley and Hannah Ann Fox. John Samuel Hoadley married Emma Caroline Peterson circa 1901. John Samuel Hoadley married Clara H. (?) circa 1923. John Samuel Hoadley died on 3 June 1947 at age 68. He was buried after 3 June 1947 at Charles Evans Cemetery, Reading, Berks, Pennsylvania. George Hoadley and family. In 1900 occupation is painter. On 12 September 1918 at National Archives and Records Administration U.S., World War I Draft Registration, Des Moines, Polk, Iowa. John Samuel Hoadley was a housepainter for painting contractor in 1940. In 1942 at U.S., World War II Draft Registration, Berks, Pennsylvania. In September 1945 at Boone, Iowa, Mr and Mrs George B Croxen returned from vacation, and hosted her aunt and uncle Mr and Mrs J. S. Hoadley. [S244] U.S. Federal Census 1910 U.S. Federal Census, by Ancestry.com, Year: 1910; Census Place: Des Moines Ward 7, Polk, Iowa; Roll: T624_420; Page: 5A; Enumeration District: 0169; ; FHL microfilm: 1374433. Name Variation Leonard Henry Hills was also known as Lennie. Leonard Henry Hills was born on 15 December 1870 at Iowa also reported as Dec 1871. He was the son of Abel B. Hills and Susan Bell. Leonard Henry Hills married Cora Elizabeth Hoadley, daughter of George Washington Hoadley and Hannah Ann Fox, circa 1896. Leonard Henry Hills died on 30 September 1953 at age 82. 1 January 1925 Des Moines Ward 3, Polk, Iowa He appeared on the census of 1 January 1925 at Des Moines Ward 3, Polk, Iowa. [S247] U.S. Federal Census 1870 U.S. Federal Census, by Ancestry.com, Page 4. Dwelling 29-30. [S246] U.S. Federal Census 1880 U.S. Federal Census, by Ancestry.com, NA Film Number T9-0353 Page Number 142C. Robert Cecil Hills was born on 19 August 1897 at Iowa. He was the son of Leonard Henry Hills and Cora Elizabeth Hoadley. Robert Cecil Hills married Thelma Lucile Leasman on 18 November 1922 at 1st marriage for both, Marshalltown, Iowa. Robert Cecil Hills married Gladys Mae McKenzie circa 1929. Robert Cecil Hills died on 4 December 1945 at Santa Clara, California, at age 48. [S250] U.S. Federal Census 1930 U.S. Federal Census, by Ancestry.com, Year: 1930; Census Place: Center, Henry, Iowa; Roll: 658; Page: 1B; Enumeration District: 0012; Image: 954.0; FHL microfilm: 2340393. Married Name circa 1929 As of circa 1929,her married name was Wheeler. Pearl Edith Hills was born on 21 September 1899 at Iowa also reported as Aug 1899. She was the daughter of Leonard Henry Hills and Cora Elizabeth Hoadley. Pearl Edith Hills married Horace B. Wheeler circa 1929. Pearl Edith Hills died on 21 August 1995 at Jackson, Oregon, at age 95. 1 January 1925 Des Moines Ward 3, Polk, Iowa Pearl Edith Hills appeared on the census of 1 January 1925 in the household of Leonard Henry Hills at Des Moines Ward 3, Polk, Iowa. In November 1915 Miss Pearl Hills visiting her aunt Mrs Sophia (Hoadley) Friel and cousin Elsie Friel. [S250] U.S. Federal Census 1930 U.S. Federal Census, by Ancestry.com, Year: 1930; Census Place: Portland, Multnomah, Oregon; Roll: 1949; Page: 3A; Enumeration District: 0058; Image: 800.0; FHL microfilm: 2341683. [S373] U.S. Federal Census 1940 U.S. Federal Census, by Ancestry.com, Year: 1940; Census Place: Oakland, Alameda, California; Roll: T627_445; Page: 1B; Enumeration District: 61-14. Married Name circa 1925 As of circa 1925,her married name was Rippey. Married Name May 1958 As of May 1958,her married name was McDaniel. Verda Vista Hills was born on 26 February 1902 at Iowa. Verda Vista Hills married Gleason Warren Rippey, son of (?) Weeks, circa 1925. Verda Vista Hills and Gleason Warren Rippey were divorced in April 1957. Verda Vista Hills married Ralph Roosevelt McDaniel in May 1958. Verda Vista Hills died on 23 March 1988 at Oregon at age 86. [S250] U.S. Federal Census 1930 U.S. Federal Census, by Ancestry.com, ED19-983. Dwelling 228.